For the purposes of these Terms and Conditions: “We”, “Our” and “Us” refers to Creative Diversity Network while references to “You” and “Your” refers to the persons accessing this website (including persons who access this site on the behalf of other persons); references to “Material” or “Materials” includes data, information and databases. Unless expressly permitted in writing in a licence agreement You must not copy, modify, alter, publish, broadcast, distribute, sell or transfer (whether in whole or in part) any Material on this website or the underlying software code or underlying data. We try to ensure that website availability is uninterrupted and that transmissions will be error-free. However, we cannot, guarantee that your access will not be suspended or restricted from time to time, including to allow for repairs, maintenance or the introduction of new facilities or services. We of course try to limit the frequency and duration of any suspension or restriction. Creative Diversity Network shall not be liable if for any reason the website is unavailable at any time or for any period. Our websites contain links, including hyperlinks, which may take you outside Creative Diversity Network websites or software. Links are provided for your convenience and an inclusion of any link does not imply endorsement or approval by us of the linked website, its operator or content. We have no control over the contents or functionality of those sites and accept no responsibility for materials published on external sites, nor any loss or damages that may arise from your use of them. Whilst every effort is made to ensure that information presented is correct, no responsibility is implied or accepted for any errors. No action should be taken or omitted to be taken in reliance upon information on this site. Access is solely at the user’s risk. Creative Diversity Network assume no responsibility or liability whatsoever for any damage suffered whether by corruption, virus or otherwise to hardware, software or other property. Certain functionality on our websites may require third party components or software and may operate with plug-ins and APIs created by third parties (collectively, Third Party Software). Your use of Third Party Software that has been incorporated into our sites will be subject to the terms and conditions of the authors and owners of such Third Party Software. All materials downloaded from any section of this website or via a link pointed to by this website are downloaded, installed, and used totally and entirely at the users own risk. The Site may give You the option to send Us content to be posted on the Site by Us (“User Content”). Any content provided must comply with the Creative Diversity Network Content Guidelines in their entirety. Creative Diversity Network reserves the right to decline to publish any contribution at its absolute discretion without prior notice. To notify us of offensive content please complete the Contact Us form. 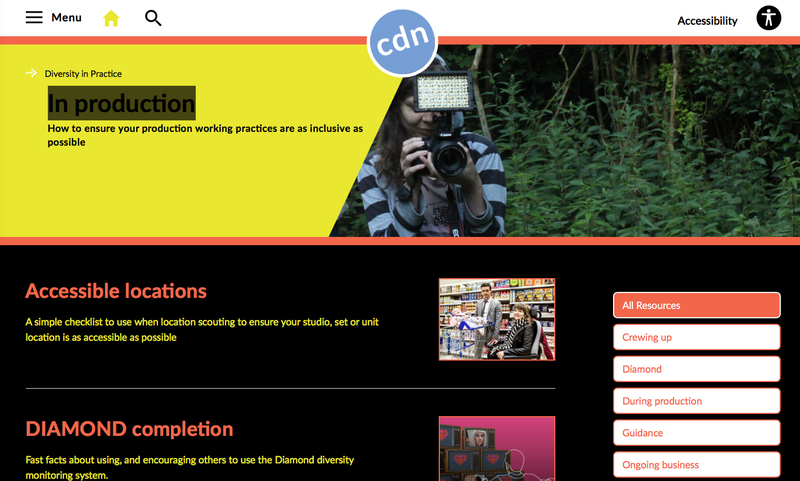 To access certain parts of the Website, Creative Diversity Network may require You to register and provide certain information about Yourself. Such registration shall be subject to specific terms of registration. By registering You accept that we may monitor individuals site usage; this information will be used to ensure appropriate use of the site and to inform product offerings and development. Your use of the website is subject to your acceptance of these Terms and Conditions. If you are not prepared to comply with these, and those of any restrictions notified to you throughout the course of your use of this website, you must exit this website immediately.